If this story fails to move you, you have no heart. As close to perfect as a tale can be. 5/5 stars and then some. What it’s about: Since his father left them six years ago, Conor has lived alone with his mum. But recently she has been struggling with illness and Conor is plagued by recurring nightmares when he is awake as well as asleep. Then the monster comes to visit. He will tell three stories and, in return, Conor must tell him the thing which frightens him most of all: the truth. The synopsis above tells you a little about what happens in A Monster Calls, not what the book is about. This is a story about fear and friendship, strength and weakness, love and loss. The tremendous impact of A Monster Calls comes from the undeniable power of a timeless story told simply. At just two hundred pages in length, every word counts in this heart-rending tale, woven with great skill and an enviable lightness of touch. A seamless blend of realism and the mythic, it draws you in so completely you forget where you are while you are reading. Read this book. If you can, make time to finish it in a single sitting, or in as few as possible. And be warned: unless your tear ducts don’t work, you should have tissues at the ready. 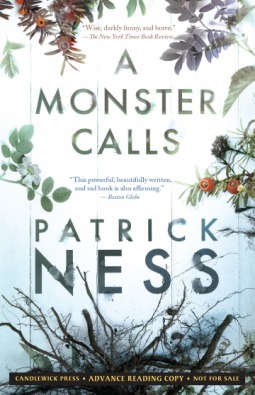 I’ve heard Patrick Ness is a good author. Ooo! Thanks for telling me something else by him I can read 🙂 I shall go and put that on the TBR, even if it is *another* series! You’ve convinced me. I need to put this book on my TBR! Eventually I’ll get through his entire back catalogue! I adore Patrick Ness. This book broke me. It’s so beautiful. Great review! Thank you. I was crying inconsolably at 1 in the morning reading this! and get an improved credit score score. that even if your monetary scenario improves and becomes stable, banks will likely be reluctant to lend you cash. While you receive the paperwork to signal, return it unsigned with a request for a quote without the PPI included. Funds can be repaid again on the arrival of your subsequent paycheck.